My purpose is not to discuss Chinese poetry in any academic sense. Instead, it is to show how certain characteristics of old Chinese Nature poetry may be used in writing English Nature poetry. The most significant of these tools is, as I have written previously, the use of “essential words” in composing lines in couplet form that when joined together with more couplets enable us to create a poem either short or long. To show how this is done, I sometimes use old Chinese poems as examples. Do not let them in any way intimidate you. I do not expect anyone reading here to learn Chinese, because my purpose, again, is the writing of poetry in English. But in doing so, there are things to be learned from certain examples of old Chinese poetry. River maple fish lights to anxious sleep. That looks a bit cryptic in English, and quite honestly, Chinese poems are often somewhat cryptic even in Chinese, meaning that they are written in old literary Chinese, which is condensed compared to modern Chinese. But that is precisely why they correspond to our “essential words” in English. Readers familiar with Chinese verses in translation will already be aware that there are multiple ways of translating them because of their compressed and often ambiguous language. At midnight the bell sound reaches the visitor’s boat. Fishing lights through river maples make sleeping hard. At midnight its bell reaches this traveller’s boat. Sleep comes hard with fishing lights among the river trees. I hear its bell at midnight as I lie here in my boat. That conveys, I think, the essentials of what Zhang Ji was trying to say. But significantly, it is now no longer a “Chinese” poem. 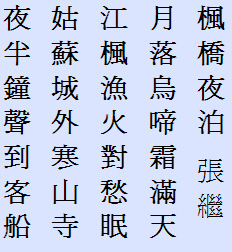 It is an English-language poem written using the Chinese technique. Nonetheless, beneath the flow of the English words one can still sense its seven-essential-words structure, which is as it should be, because that gives it its pattern. One can write countless poems in this manner. If you find the seven-word structure a bit too much at first, begin with a five-word structure. Once you get the hang of it, writing Nature poetry in the old Chinese manner becomes very easy — but the result is throughly English (in the language sense, not the national). Remember not to be too literalistic or rigid as you work with essential words. As an added and non-essential note, remember that in writing such poems we are using only one aspect of old Chinese poetry, which differed in significant ways from how we write here. The major difference — aside from language — is that old Chinese poetry rhymed. And it had a rhythm that seems rather “sing-song” to English speakers. Jiāng fēng yú huǒ duì chóu mián. If you are wondering what all the little marks above the letters mean, they indicate the tones in Mandarin, Chinese being (unlike English) a tonal language. That has four lines, like the poem of Zhang Ji, and it has the same rhythm as Night Mooring at Maple Bridge. Now perhaps you can see why we do not customarily translate Chinese poems into English using rhyme. In fact when I read Chinese poems in translation, I deliberately avoid those translated with rhyme, because inevitably they come off as childish and they stray too far from the original meaning. That does not of course mean the poems are childish in the original. It just means that in moving them from one culture to another, they take on characteristics that we customarily think of in English as childish, if they are translated using the rhythm and rhyme found in Chinese originals. It is a matter of cultural and linguistic difference. But again, all of that has nothing to do with my purpose here, which is not to duplicate Chinese poetry in English, but rather to take what is useful in old Chinese poetry and to apply it to the writing of new Nature poems in English. In looking over past statistics for this site, I noticed that one of the most frequented postings was on writing “Chinese poetry” in English. Of course what is meant by that is poetry written in English, but using the form of old Chinese Nature poetry as a framework on which a poem may be constructed. Readers here will recall that I previously discussed Chinese poems of five and of seven characters, and how those structures may be transposed into English. To write such poetry in English we must think in terms of “essential words,” by which is meant words essential to meaning. If I write, “Tomorrow I shall go to the book shop to look for a book on poetry,” then the essential words in that are simply “Tomorrow I go to book shop look for poetry book.” The latter sentence is not at all good English, but it is completely clear and understandable. And that is the way we write “Chinese” poetry in English — we use such essential words as a structure. So the first thing one must know to write a “Chinese” poem in English is that it uses a framework of essential words, usually either five per line or seven per line. The second thing one must know is that Chinese poems are written in couplets, meaning in pairs of lines. So a finished verse will have an even number of lines, not an odd number A poem is constructed by using a given number of essential words for each line in the couplet, and one adds further couplets until the desired number of verses is achieved. It is just that simple. It will not work precisely, but as an example we may use an old verse translated by Arthur Waley. Then we can “reverse-engineer” that line to see how it fits into this way of writing verse. I look toward the kitchen, but no smoke rises. There are four more lines, but I shall leave them off because they are a bit too culture-limited, and these are enough for my purpose. Cotton dress seek sunlight porch. North garden rotting boughs heaped. Look kitchen no smoke rises. Light going not time read. There you have it. We have stripped to poem down to its basic elements, and this gives us a structure to use in writing the poem in “normal” English. In doing this, we must be neither too literalistic nor too rigid. There are many words in English that are synonyms, so we need not use precisely the words used in our “framework” version, and of course we need to add those words essential to good, standard English, meaning words like “the,” “a,” “an,” as well as the correct grammatical forms. Dressed in cotton I seek the sunlit porch. In the northern garden rotting boughs are heaped. I empty my cup drinking to the dregs. I look to the kitchen, where no smoke rises. The light is going, no time to read. Dressed in cotton, I seek the sunlit porch. I empty the cup, drinking to the dregs. That will do, but there is yet another step that we should take — minimally one, but possibily more. We want the poem to comfortably “settle into” normal English, and that means again that we must avoid rigidity in moving from the framework to the finished poem. So here is the poem taken just one step farther. Clothed in cotton, I seek the sunlit porch. North, the garden heaped with rotting boughs. And look to the kitchen, where no smoke rises. But the light is fading — no time left. As long as we have the basic elements of a poem, we have something to work on, and that is what this technique does — it gives us a structure. If you use it to write new poems, it will of course seem silly to call them “Chinese” poems because they will be written in English — but we are using the Chinese poetry technique to give us the structure that enables us to write such poems easily. One may easily see that the last stage of the poem given here could not only be worked further if desired, but it could also be used as a jumping-off point for writing quite different lines. And of course the fundamental notion behind all this is that one can use the five or seven “essential words” structure in composing completely new Nature poems. Try it, and you may be surprised how easily you can now write poetry — if you have an inherent poetic sense. THE LAST OF HOKKU HERE? I have long made no secret of the fact that in my view, the hokku tradition of Japan was greatly distorted when it was introduced to the West as “haiku.” Instead of paying attention to R. H. Blyth, Westerners instead listened to the the haiku societies and self-made authorities that were busy re-making the hokku in their own image. Consequently hokku was never really successfully transmitted to the West, but instead fell into the hands of those who used it for their own purposes, greatly changing it in the process. That has been the situation since the middle of the 20th century, and if anything, that situation has become even worse today, as do-it-yourselfers continue to turn the hokku — misrepresented as “haiku” — into just another ill-defined kind of Western brief verse, with the only thing left of hokku being, in most cases, its brevity, and sometimes not even that. Even when modern haiku enthusiasts claim to keep such elements of hokku as the focus on Nature and an emphasis on season, one finds that in practice they have no understanding of the aesthetic principles behind these elements. It shows immediately in their writing. For almost fifteen years I have been presenting a different view of hokku, one that restores what to me are its unique virtues as a kind of spiritual verse. Over the years I have carefully explained everything from the form and punctuation of hokku in English to its aesthetics, including how it fits into the cycle of the seasons and how its focus is Nature and the place of humans within and as a part of, not apart from, Nature. Some fifteen years of presenting hokku should be sufficient. If those reading about it here have not gotten the point in that time, one has reason to suspect they never will. But of course new readers are always appearing, and one never knows when one among them will suddenly “get” what hokku is all about, in spite of all the baggage people may carry from exposure to modern haiku. And if the times are unpropitious to hokku and its Nature-based aesthetic, one must simply not try to hasten the process; one must be patient and hope that once again humans will begin to recognize that Nature is their mother and father and their home, and that those who harm Nature harm themselves. What does all this mean for this site? It means simply that after discussing hokku and all its methods, techniques, and implications for such a long period of years, the time has come to relax a bit and to include discussion of other things — things beyond but still related in some way to the spirit of the hokku. One might think that after years of writing on the topic, the hokku has been more than sufficiently discussed and explained in all I have presented here since I first began so many years ago, long before anyone else was teaching either hokku or haiku on the Internet. But once one has developed a great interest in hokku, it just becomes a part of one’s life, and comes up naturally now and then in whatever one thinks and does. Hokku is significant as a manifestation of a way of life and action, but there are other manifestations as well, other things I hope to discuss here — many of them not too far afield from the hokku and its atmosphere of poverty and simplicity and focus on Nature and the seasons. We have just passed Halloween — Samhain in the old calendar — the end of the ancient year. Now we go into the darkness and the cold of winter — the Yin time, the time of returning to the root — out of which a new year will eventually be born. The old cycle of the seasons continues, and this site will continue too, even though it is sure to change in one way or another over time, just as all things in Nature change in keeping with the workings of Yin and Yang. Those of you who have studied hokku with me over the years really should now be on your own. I have given you the knowledge, but if you are unable to provide skill and the right spirit, that knowledge will come to nothing. I have done what I could. And though I shall continue to talk about hokku, as time goes by it will increasingly be up to others to keep the hokku alive or to let it fall into decay and be forgotten. I can only do what I can do, and all else is beyond my control. That is life. Things come and go, people come and go, and though I continue to talk about hokku here, I shall not be around forever to teach and explain it. Whether or not the hokku falls into obscurity and is forgotten under the overwhelming deluge of mediocrity exhibited in modern haiku will be up to all readers of this site. One hopes they will not let it happen, even though past experience with human notions of responsibility does not give great encouragement.